WASHINGTON – Arizona’s delegation split down party lines Wednesday on a bill to fund the Department of Homeland Security while stripping funding for President Barack Obama’s executive action on immigration. Republicans voted overwhelmingly for the bill that they called a response to Obama overstepping his power in November when he issued executive orders that would shield nearly 5 million immigrants from deportation. The funding bill passed 236-191, with only two Democrats voting for it and 10 Republicans opposed. Arizona’s House members followed suit, with all five Republicans in favor and all four Democrats opposed. But Democrats called Wednesday’s vote little more than political theater: The bill is unlikely to pass the Senate, they said, and the president has vowed to veto it if it reaches his desk. “This is a way for them to be able to pound their chest to their constituents and say, ‘See how mean we are,’ and ‘See how fierce we were,’” said Rep. Ruben Gallego, D-Phoenix, after Wednesday’s vote. The bill would do more than block the president’s November actions – it would also reverse the administration’s 2012 Deferred Action for Childhood Arrivals program. That program, which defers deportation of immigrants who were brought to this country illegally as children, has allowed 600,000 people to come forward, pass background checks and get authorized to work and pay taxes, said White House Domestic Policy Director Cecilia Munoz. The president’s orders followed months of congressional inaction on comprehensive immigration reform. The Senate passed a bipartisan measure – co-sponsored by Arizona Republican Sens. John McCain and Jeff Flake, among others – in June 2013, but the measure never came up for a vote in the House. Munoz said in a conference call Wednesday that the president believed he was “well within his legal authority” to take the actions he did in November, and she said he would veto the House legislation blocking his actions should the bill reach his desk. Munoz said “the priority is to fund the department” with a clean bill. That was echoed by Rep. Raul Grijalva, D-Tucson, who said Republicans were holding the department’s budget hostage. Salmon’s amendment to the Homeland Security bill focused on another popular GOP target – the Affordable Care Act, or Obamacare. “This is, again, just more gamesmanship and just playing political games by the Republican Party,” Gallego said. 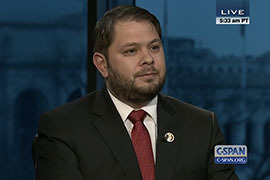 In an interview before Wednesday's vote, Rep. Ruben Gallego, D-Phoenix, said House Republicans were holding the Department of Homeland Security funding ''hostage'' in hopes of ''placating the Tea Party base'' of the GOP. 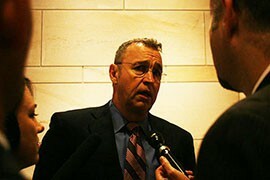 Rep. Matt Salmon, R-Mesa, in a September file photo. Salmon said Wednesday that President Barack Obama's executive action on immigration reform was "unconstitutional and illegal."